I’m so glad Sony finally decided to come back to the AI and robotics frontline. As many of my colleagues working in robotics, I was so disappointed 11 years ago when Sony decided to discontinue Aibo and Qrio… Aibo played a very significant role in research, being a really good performing robot in challenges such as the Robocup, it was a shame to lose all that research momentum that we had acquired over the years with such a nice platform. Aibo resurrection is great news, the new model, Aibo ERS-1000, resembles a lot the last ERS-7 model. It is now available to pre-order in Japan, going on sale around mid-January 2018. Check the official Aibo website for more details. The rest of the world will have to wait a little longer for the new Sony Aibo. It’s for us to see now whether Sony has been doing a great effort during these years to improve the robot or it is just coming back to a redecorated version of the ERS-7 (according to the company they’ve been working on AI internally over these years, although no commercial products were available). My humble opinion: you need to be in the market, even when AI is not the trending topic, in order to really advance the field and play a significant role in the development of new AI and robotics products. Over these years, in many research areas and business prototype applications, Aldebaran Nao kind of took the place left by the discontinuation of Aibo. It’ll be interesting to see now if Aibo is able to reclaim its lost position. My opinion again, that depends on how well the company does with SDK and APIs. Of course, apart from research and business applications, we have the wide potential market for robotic pets. But again, I think the success in this market depends on the ability of Sony to foster a strong research and developer community around Aibo. Keeping a technology-closed or fully proprietary platform will prevent Aibo to reach its full potential. On the other hand, if Sony decides to go for an open community collaboration, my guess is Aibo will have a successful future. There is no doubt that current enthusiasm about AI and Deep Learning is influencing all companies worldwide and all industries. Sony decided to take a step back from this arena more than a decade ago, let’s see now if they can keep a strong position in such a competitive domain these days. One key feature of new Aibo is clearly artificial vision using deep learning, and here we can make some comparisons with Google TensorFlow. 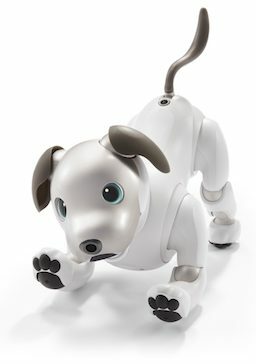 Sony has developed their own neural network libraries (see https://nnabla.org/), which are written in C++ and designed to be embedded in devices such as Aibo. Apart from that, the whole library scheme seems to be much like TensorFlow. There is a web-based and app-based neural network console you can use to play with Sony’s neural network lib (https://dl.sony.com/). However, it looks like it is only available in Japan for the time being… So, we’ll stay tuned for news about this. The new Aibo is being evaluated at Psicobōtica Labs as a possible platform for social interaction training. Author Raúl ArrabalesPosted on November 10, 2017 November 10, 2017 Categories Artificial Intelligence, RoboticsTags aibo, ers-1000, Sony2 Comments on Sony Aibo is back!